The Miami Hurricanes’ 41-13 blowout win over the Bethune-Cookman Wildcats was not unexpected, but there were standout moments that the Canes will undoubtedly try to carry into week two. Despite getting off to a shaky start in the Sept. 2 matchup, Rosier displayed his ability to throw the ball downfield – even if some of his passes were slightly off target. In the second quarter, he showed exactly what he was capable of with a 46-yard bomb to redshirt junior Darrell Langham. 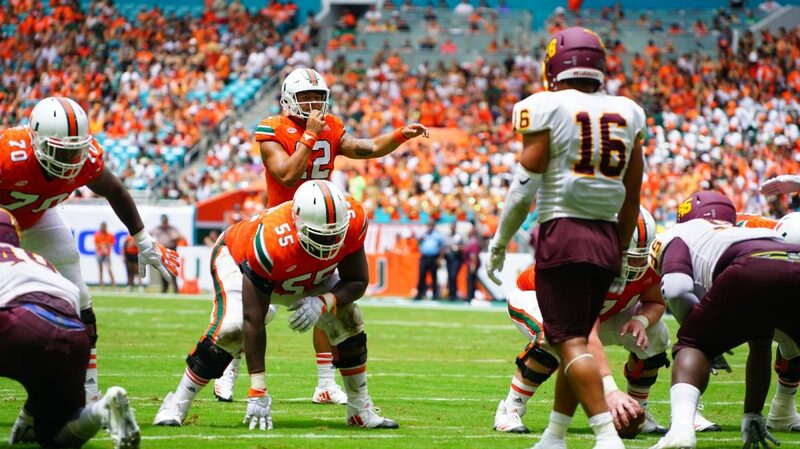 Now that Rosier has some experience under his belt, fans will expect more of him as the season progresses. Former UM quarterback Brad Kaaya was an accurate passer when protected, but his productivity took a major dip when pressure forced him to move out of the pocket. Rosier embraced running out of the pocket and showed it will not be a problem. On the first offensive play of the game for the Canes, he rolled out to his right and easily picked up 23 yards with his legs. Under pressure in the first play of the third quarter, he ran to the left sideline to pick up another 15 yards and a first down. For head Coach Mark Richt’s system, in which he loves to run the option, this combo is perfect. All-ACC running back Mark Walton is set up to have a big year. He already has 148 yards and two touchdowns after the first game, but he can’t do it alone and will need some rest each and every game. During spring camp, there were a lot of questions about the depth at the running back position. Redshirt junior Trayone Gray was coming back from injury, and highly-ranked freshman Robert Burns had a shoulder injury that kept him out of contact for months. But during fall camp, Homer proved to be the player best suited to be the No. 2 guy at the position, and he solidified that against the Wildcats. Albeit against an FCS team, Homer showed signs that he can carry his own. Not only did he rush for 103 yards on 11 carries, but he displayed the ability to catch the ball in the backfield, even if it was off two receptions. Rosier seemed to trust his running backs when a play was breaking down, so having a player like Homer to pick up yards down the sideline will be vital. “I don’t know how many times the backs had to hook up and block somebody in pass protection, but Travis ran the ball well and he secured the football – that was big,” Richt said. With 934 receiving yards, sophomore Ahmmon Richards grabbed the attention of the entire ACC last season, breaking Michael Irvin’s 31-year record for most receiving yards in a season for a freshman. Richards was out with a hamstring injury in the season opener, and others stepped up to show that Richards is not the only wideout who can make noise in the ACC this season. Both redshirt sophomore Lawrence Cager and redshirt junior Darrell Langham stood out, and not solely because of their size. Coming back from injury, Cager showed that he can run smooth routes with his touchdown grab against the Wildcats. Langham exhibited great hands, both on the long 46-yard snag from Rosier and on his touchdown catch, for which he out-jumped his defender in one-on-one coverage and secured a tough catch. “He told me to ball out, just play like I always play – how I’ve been doing in the spring, just keep that up,” Langham said of Richards advice. We are only through week one, but those skills don’t just go away, and both Cager and Langham have the ability to make an impact down the line. It seems like freshman safety Amari Carter delivered the hit heard around the world, with a brutal shoulder tackle on Bethune-Cookman tight end Demetrius Weaver. Carter forced a fumble, and Miami recovered. You can’t teach toughness, especially at the U. It seems like Carter has it. The ‘Canes only interception of the day came from sophomore cornerback Malek Young, who picked off an overthrown pass by Wildcats quarterback Larry Brihm. He was promptly awarded with the “Turnover Chain,” a new incentive mechanism Defensive Coordinator Manny Diaz is testing this season. Whenever a UM defensive player forces a turnover, that player gets the honor of wearing a gaudy, thick gold chain while resting on the sideline. If it weren’t for penalties, a few other Miami players may have had the chance to rock this new prestigious piece of jewelry. On three separate plays, UM defensive backs, including freshman corner Trajan Bandy, seemed to have intercepted a Bethune-Cookman pass. But on all three, the turnovers were called back because of flags. Yes, “almost” interceptions don’t count, but it’s a good sign if the ‘Canes have defensive backs who have eyes for picking off the football. These are all positive signs for the Hurricanes moving forward, but we’ve only seen one game. Anything could change come week two’s matchup against the Arkansas State Red Wolves, and the competition will only get more difficult. Only ime will tell.